UPDATE: On Aug. 8, Cook County withdrew its lawsuit against the Illinois Retail Merchants Association and will no longer seek damages for lost revenue. “Now that the Appellate Court has rejected the emergency motion that would again prevent us from collecting the sweetened beverage tax, we believe we should move forward cooperatively and in good faith with the County’s retail industry,” Cook County Board President Toni Preckwinkle’s office said in a statement. Cook County Board President Toni Preckwinkle is seeking $17 million in damages from the Illinois Retail Merchants Association, or IRMA, according to Crain’s Chicago Business. IRMA has challenged the Cook County soda tax multiple times. Shortly before the tax was supposed to take effect July 1, IRMA filed a lawsuit against Cook County, arguing the soda tax was unconstitutionally vague. An appellate court upheld a temporary restraining order on the soda tax, which lasted almost a month. During this period, a Preckwinkle spokesperson told Crain’s that the county suffered more $20 million in financial damages. On July 28, Cook County Circuit Court Judge Daniel Kubasiak upheld the soda tax. On Aug. 1,IRMA announced it was appealing the decision, but the tax still went into effect Aug. 2. IRMA stated it would “exercise [its] rights” and continue with the appeal. Kubasiak expressed concern about the precedent Cook County was willing to set. “I could find no such case of a governmental body suing a taxpayer who had challenged a tax,” he said according to Crain’s. The new soda tax will be added on top of Chicago’s combined sales tax of 10.25 percent and the city’s 3 percent beverage tax. 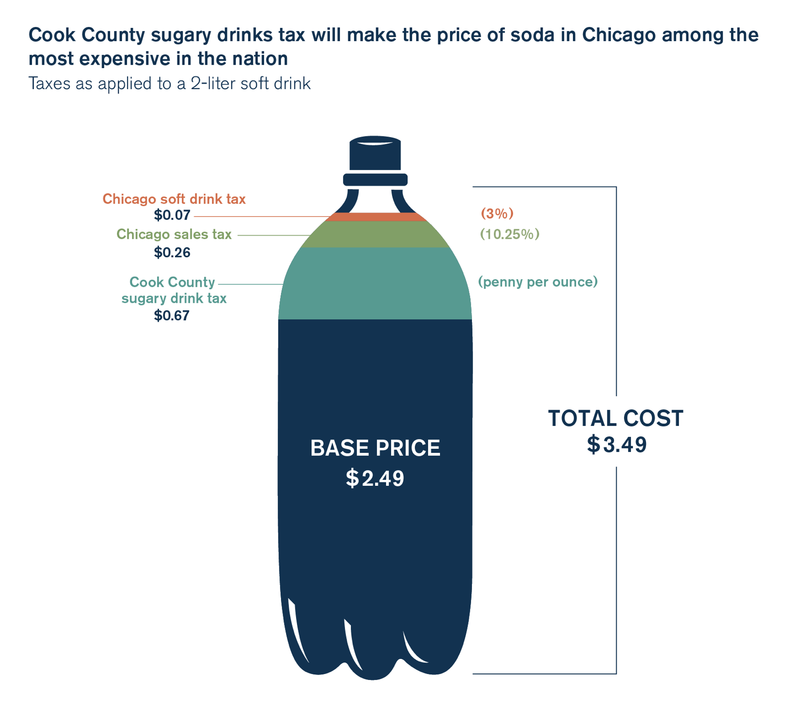 With the new sugary beverage tax, soda in Chicago will be some of the most expensive in the nation as a $4 12-pack of soda will cost $5.97, an effective tax rate of nearly 50 percent. The new tax on sugary beverages will also affect fountain drinks, energy drinks, bottled tea and coffee products, diet soda and juices that aren’t 100 percent fruit or vegetable juice.